A party is not a party unless there is great entertainment. Serving just food and drinks isn’t enough - unless you’re contented with having a mediocre gathering of people, where everyone can’t wait to leave and go home. It doesn’t matter what kind of party it is, either. The purpose of a party is to bring people together, have some refreshments, mingle with others, and - most importantly - have a lot of fun. For this reason, it can be challenging to become a host. However, if you’ve got the right tools in your arsenal, then you need not worry too much. Having outdoor games and other activities for everyone to participate in can help you out with this. Luckily, KC Bouncy Castle Hire offers all the games that you can ever need. One of these games is our Giant Connect 4. Don’t be fooled by the colour and presentation - this isn’t just a kids’ game. We have seen grown-ups line up to get their turn to play this game. Anybody can play this game. It offers some of the best garden fun that you can give your guests at any time. If you are a fan of big games, then you’re guaranteed to have a ball. 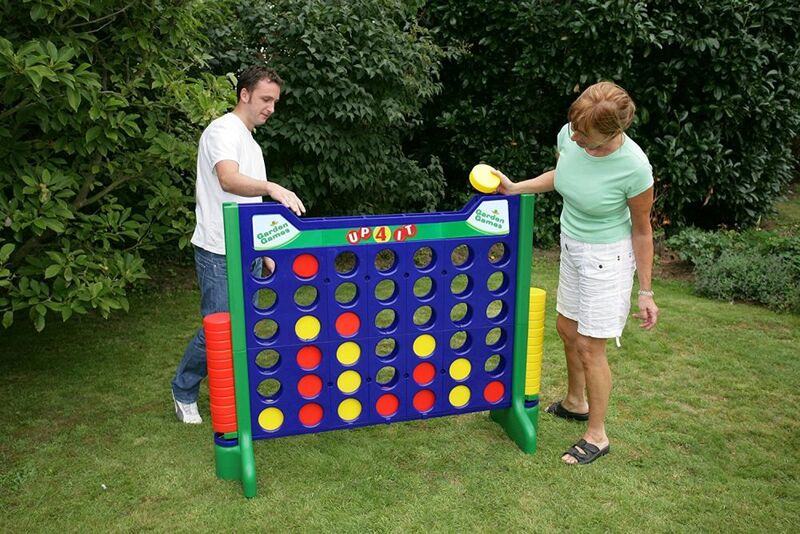 When you put this game out on your lawn or garden, you can instantly see people getting curious as to what all the fuss is about. You can get things started by playing yourself. Before you know it, people are forming queues and the competition is as high as ever. In fact, you can even have a proper, albeit miniature, tournament for everyone to participate in. ?Get out the colour-coded counters. Divide them into two colour categories. ?The goal of the game is to have four counters of the same colour in one line. A vertical, horizontal, or diagonal line will do. ?Take turns with your opponent to drop counters into the frame. ?There are no “passes”, otherwise, you just forfeit your turn to play. ?The first player to have four in a row wins the game. There are special cases when you get five instead of four of your colour in a row. This loses the game. This is rare, but possible. Another special instance is when the board gets filled up fully without anyone winning the game. In such cases, it is declared a draw. The game can be addicting, and you hardly notice the time pass as you keep playing over and over. The game can be hired for an entire day, for just £15. You can also check out the other games and activities available on our site. We carry everything your party can ever need. For more information on booking, call us or send us an email. Check out our FAQ page for common queries. For advanced concerns, drop by the Contact Us page and we’ll get back to you as soon as possible.